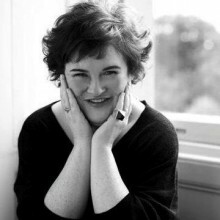 Susan Magdalane Boyle (born 1 April 1961 in Blackburn, West Lothian, Scotland) is a Scottish singer who came to international public attention when she appeared as a contestant on reality TV programme Britain's Got Talent on 11 April 2009, singing "I Dreamed a Dream" from Les Misérables. Her first album was released in November 2009 and debuted as the number one best-selling CD on charts around the globe. Global interest in Boyle was triggered by the contrast between her powerful voice and her plain appearance on stage. The juxtaposition of the audience's first impression of her with the standing ovation she received after her performance led to an international media and Internet response. Within nine days of the audition, videos of Boyle from the show, various interviews, and her 1999 rendition of "Cry Me a River" had been watched over 100 million times, an online record. Despite the sustained media interest, she later finished in second place in the final of the show, behind dance troupe Diversity. Boyle's first album, I Dreamed a Dream, was released on 23 November 2009, and has become Amazon's best-selling album in pre-sales. Its first single is a cover of the Jagger/Richards song "Wild Horses." The album includes "You'll See," "I Dreamed a Dream," and "Cry Me a River." According to Billboard, "The arrival of "I Dreamed a Dream" ... marks the best opening week for a female artist's debut album since SoundScan began tracking sales in 1991." Respected readers if you are reading this, you are on on the subpage of the singer susan boyle in our eLyricsWorld. Our database has disposal of information about 52389 artists throughout the world as well as 829824 songs 73 of which are from susan boyle. Besides the artist's biography, on this page you can see short piece of information about them, which includes birthdate, genre, record label Be aware all the facts with susan boyle by adding RSS link. If you prefer you could directly visit the address you are on at the moment and look through news and latest songs about the artist.